After pretty much not getting anything productive done (except running of course) for almost three weeks, yesterday was the first day back, as it was for many people. My to-do list is longer than Lindsey Lohan’s rap sheet, but I got a good chunk out of it done yesterday. Well, now that I look at the list, it’s still really super long. I guess it probably doesn’t help that I keep adding things to it, huh? The good thing is that I’m running again and I decided on what to do with training/coaching for my Ironman. I counted the weeks. It’s in 42 weeks from Saturday. I’m not sure if I’m happy about that or terrified…. Over the holiday, I asked a general question on the Facebook page Tri Talk regarding good books for IM training since I couldn’t afford a coach. I got several responses, but one happened to be from one of the coaches from the local group I belong to on and off, Without Limits. Sami is the Ironman Queen and happened to reply to talk to her about coaching and that we could work something out. I don’t know her well, but I do know she is the bees knees when it comes to Ironman. I didn’t want to pay for the coaching since I’ve spent so much on IM already plus all the coaching I’ve had for the running events, yadda yadda, money money, typical feeling guilty things for me spending money on my stuff. Sami and I chatted back and forth about trying to work something out, but one morning, I woke up at 5 am and all I could think about was the Ironman and coaching. I guess maybe it was a moment of clarity, because I suddenly realized that it would be absolutely stupid of me to pass up the opportunity to be coached by Sami, especially when she has so much experience and passion for the Ironman herself. And by the way, she has done TWELVE IM’s and qualified for Kona in November. So why in the world would I rely on books and the internet for information when I could have a personal coach for the biggest, most complex event in my life? I could have someone to work with, to ask questions to, to help me through something that is foreign to me. So this late spring/early summer, I’ll be starting a plan with Sami to get me to the finish line at Ironman Florida in November. Clarity. Gorgeous way to start 2015! My marathon is March 22nd. I haven’t been doing much, if any, speed or tempo or hill work, because I don’t want to aggravate the grumpy old man, otherwise known as my shin splints. I feel very behind, but I am healing. Slowly. Thank God! 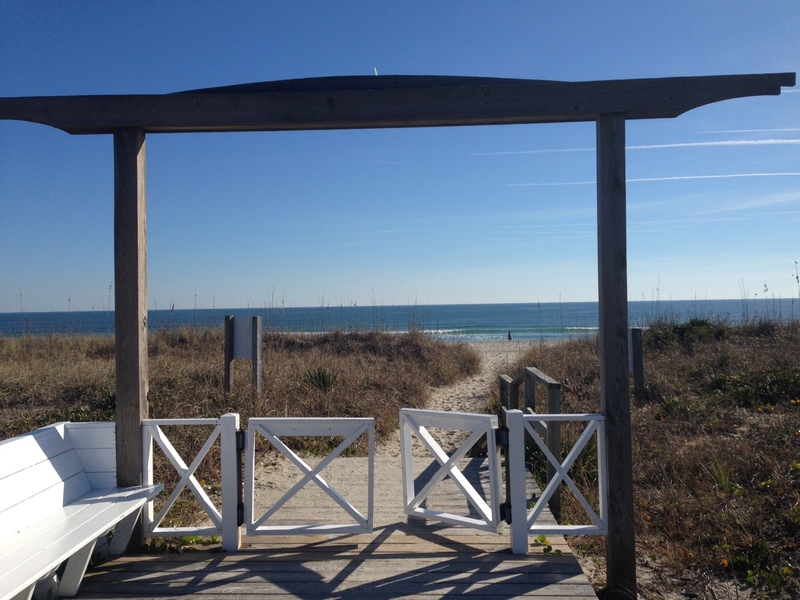 New Year’s Day started with a good 6.5 mile run with friends at Wrightsville Beach, followed up with a soak in the freezing cold waterway. I certainly didn’t want to put my legs into 50 degree water, but I knew it was the right thing to do considering my mileage that I did during the week and what was coming for the weekend. Let’s say that I wasn’t as brave as some other runners who put their lady bits into that cold water. I think I would have died. The little ripples are from my shivering. Saturday I was lucky enough to have company for my 8 mile pace run. It wasn’t easy, but it was definitely doable, and we got it done in average 8:20-something pace, honestly I don’t really know. My Garmin does not like trees or clouds, and since we ran in trees AND clouds, it said we were going 9:00 plus pace part of the time, which I know was not accurate. So I’m not EXACTLY sure what the pace was, and that irritates the crap out of me. I just estimate the best I can on Garmin’s fussy days. I think it’s related to my shin splints. Moody and grumpy. I was a little nervous for Sunday’s 16 mile run because it was going to be warm and it was supposed to rain. Luckily, the rain held off, but it was just gross outside, like the air of a man’s dirty beard. Ugh. 72 with almost 100% humidity after not running in that for a few months was just difficult. I made it through, but I don’t have any idea of what pace I was going. Garmin had another funky day with the clouds, but mostly, it got turned back on somehow so was ticking away as I was driving home. I got home and the feast started. First, it was a berry smoothie. 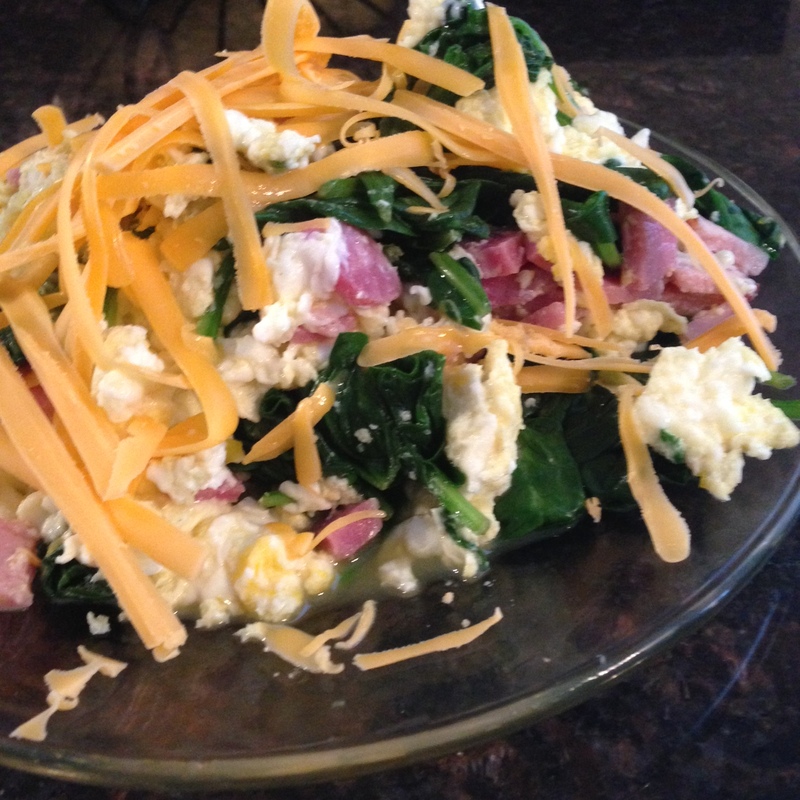 Then it was a 4-egg (1 1/2 yolks to 4 egg whites) scramble, plus about half a pound of spinach, ham, and cheddar. It was goooooood. I drank a Zip Fizz recovery drink, had an endurolyte pill, and several cups of water, some almond milk, and then some coffee. When the feast was over, I was happy to report that my legs felt just tired, I had no pain, and my belleh was full. Score. On Monday, I had an easy 3 mile run, but because there’s an Ironman in the picture and I took on the slacker role over break, I knew I needed to get to the pool. I headed there first thing in the morning and was met with zero ability to swim. It was like I hadn’t been to the pool in months. Can you say “doggy paddle”? Oy. I made myself finish a mile and work on form – a.k.a. finding my form. After I got home, I headed out for a nice easy 3 mile run. My legs were slightly achy from the weekend running, but no pain. Could I be healed? Dare to dream! After my run, I got to working on my “Lindsey Lohan Rap Sheet” to-do list. I worked all day on the crap I should have done the last few weeks of December, and I felt good about what I got done. As for today, ah today, today is one of those days that I will never quite forget, but I certainly do not want to repeat. I’ll call it the “Helga situation”, and was the final event wrapping up the accident that happened in August. I’m planning to write about that later this week assuming my to-do list becomes shorter as the days go by. Bonus was we walked by where they film “Sleepy Hollow” and I have proof. When I got home from lunch with my sister to celebrate the ending of the “Helga Situation”, I decided to go ahead and knock out my run. I didn’t feel mentally ready for a tempo run because of everything and I was depressed from everything, so I thought I would figure it out as I went. Much to my surprise, I started out a race pace and quickly moved into my tempo pace, where I stayed for three miles, finishing 3.1 in 23 minutes. Not too shabby, especially with a belly full of Diet Coke and Bun Thit Nuong. I finished with 5 miles in 40 minutes, and I am so thrilled to 1) complete this tempo run in the first place and 2) report there’s no pain and 3) not throw up lunch. Faster-than-race-pace has been the big trigger with my grumpy old shins, so I was worried about this run, especially since I did bring it down to 7:00 pace and a little below for a while in the 3 faster miles. So far, so good! Today was another reminder for me to always give it my best shot, even when I may not be feeling mentally or physically up to a certain challenge or workout. The rest of the week’s running is pretty easy, but this weekend will be an 8 miler on Saturday followed by 17 on Sunday. The weather looks cool and dry, so at least we won’t have “dirty beard” conditions to get through. I’m going to give this marathon my all, and next week starts more speed and hill training. I’m ready. Have you ever been to court before? What do you do when you’re mentally DONE but have a pace workout? 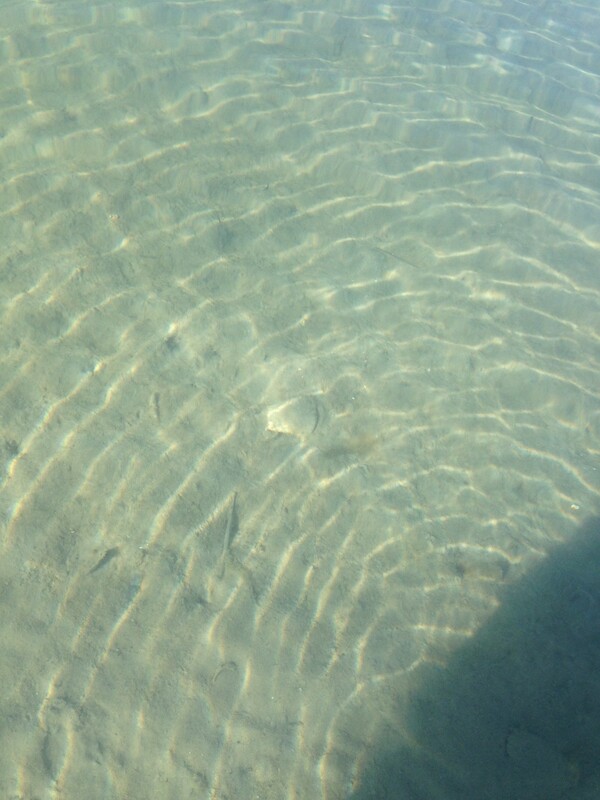 That water looked so inviting until you said how cold it was. I have a pace workout tomorrow. Hopefully I will be mentally present the whole time, but on the chance that I fall off the wagon, music normally helps me to at least zone out and not think about how over it I am. I’m glad your 16 miler went well and was pain free!! The water sure is beautiful but deceptively so. I know how your workout went and way to kick some booty – do you usually run with music? I find that it almost ALWAYS helps either get me going or keep me going at a faster pace. I even drive faster to my 5k playlist 🙂 Love my tunes. So happy Kelli you are back running, and the shin splints are healing. Thank you 🙂 It’s been a long haul! I’m glad that I can see the big huge light at the end of the tunnel, as long as I don’t ruin it by running all the miles too fast! It’s totally something I could do…. but I won’t. It sounds like healing is occurring here 🙂 I’m glad your long run went well! Thanks! It’s a tad sore after my run this morning that ended up being faster than what it should have been, but definitely not sore like it used to be. Lots of stretching and therapy and ice today! I’m going to have to pull a lot of workouts off when I don’t really want to or feel like it – probably a lot this summer, so might as well just give it a whirl instead of defeating myself before I even get started! The key is being able to adjust when needed! Ooh! Any Ichabod Crane sightings? I recently binge watched Sleepy Hollow while in the treadmill. He’s adorable. It’s awesome you found someone with so much ironman experience and success to coach you! I have not been able to see him, but I won’t stop trying! I’m always a day late! Grrrrr.